NES Kirby's Adventure (USA PRG0) in 34:22.22 by TASeditor. 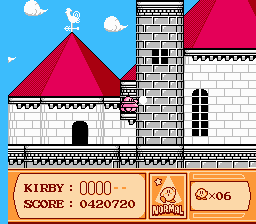 Kirby's Adventure is a colorful game that's very long for a NES game. Normal gameplay forbids the UFO from being taken from level to level, but using a bug discovered by kirbymuncher, TASeditor manages to keep the UFO, and blazes through much of the game using it. The speed with which he defeats midbosses and bosses is often very surprising. This new TAS of Kirby's Adventure is an improvement of 2:19.65 over JXQ's run. To see the game completed even faster, see this run, which uses an unusual glitch involving the Stone ability and water to activate the credits early.